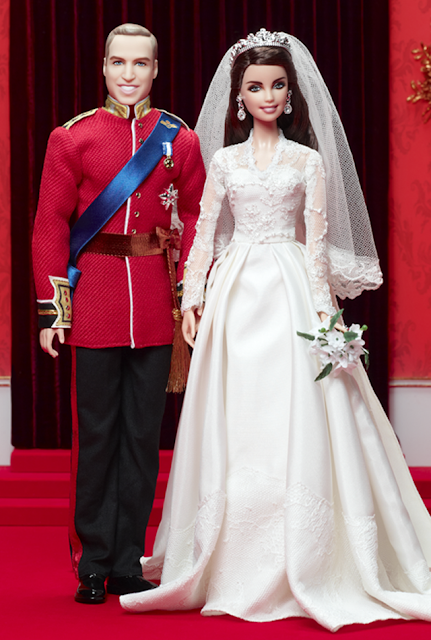 Look what I found on the Barbie Collector website...the "Royal Wedding® Gift Set includes exquisite portrait dolls of the bride and groom now bestowed with the titles, Duke and Duchess of Cambridge." Catherine's dress is gorgeous and the details are impeccably recreated with the set of collectible dolls. These commemorative set will arrive just in time to celebrate William and Catherine's one year anniversary in April. Maybe these can be my present from the Easter Bunny since I'm pretty positive I NEED them. I'm seriously considering raising the appropriate age to collect Barbies from 10 to 19, because I NEED these. They are adorable! cant believe its almost been a year!